I finished Love in the Time of Cholesterol by Cecily Ross and wrote a book review for Weekend Cooking complete with a recipe for avocado pizza that my commenters are more intrigued by than I expected. I also finished Bonds of Justice by Nalini Singh, #8 in the Psy-Changeling series. I liked the #9 book, Play of Passion, (which I accidentally read before #8) better because I related to the characters more. But I love the Psy-Changeling world so much that I don’t have to fully embrace the characters to enjoy the stories. I read the first of two essays in Between Barack and a Hard Place by Tim Wise. The local group discussing it met for the first time last night. Since we’re going to meet for at least three sessions, I’m well ahead of where I need to be in the reading of this, so I am going to put it on the back burner for awhile. We had a great meeting, by the way, with over thirty people in attendance. Several of them picked up my schedule for the book group that I coordinate in Kirkwood, meeting most months to discuss books about race in America. I have started reading The Dream-Maker’s Magic by Sharon Shinn, third in a trilogy for young adults. These are set in a fantasy world and feature young people who discover extraordinary abilities. They are gentle and sweet, a perfect distraction from the scary weather conditions we’re encountering this week. 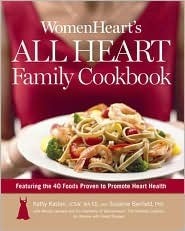 I am also reading the beginning material in the WomenHeart’s All Heart Family Cookbook by Kathy Kastan. I usually scan cookbooks, but this has enough information that I have been reading a few pages a day for several days now and have yet to make it to the recipes. The Dream-Maker’s Magic book will go pretty quickly. The next two books in the stack are Cupid by Julius Lester and Happy Ever After by Nora Roberts — two good books for the approach of Valentine’s Day. Since it’s the last day of the month, I’ll also record here some book posts I made this month, my first month of being a book blogger! Ooh, that All Heart Family Cookbook looks good to me!